Fridge Friday Part III | Nicole, Deipnosophist. The final refrigerator is unveiled! I know the suspense is killing you. This is the bar refrigerator, unstaged. It was on the floor until my c-section made it impossible for me to crouch to retrieve things; we never put it back on the floor. It’s much more convenient but it’s pretty ugly to see the back of a refrigerator on the bar. Anyway, the contents are: top shelf, a day’s worth of milk for Ainsley and a freezer pack in the freezer. 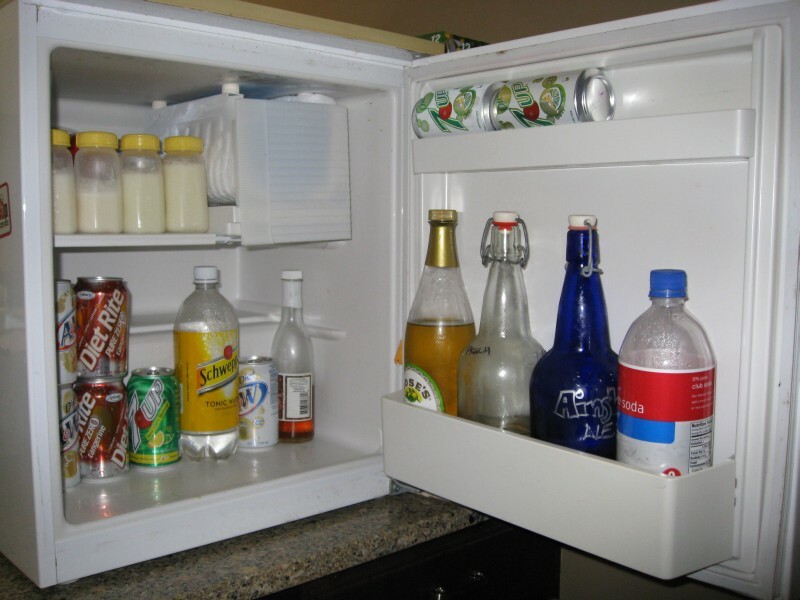 the rest of the fridge is full of beverages and perishable drink mixers. The bottle under the freezer is olive brine for martinis! The door also holds some peach mead (it finally tastes good) and Ainsley’s Ale. Ainsley’s ale has turned out to be my best homebrew to date IMO. It’s perfectly balanced and delicious. So good that it’s sippable more than gulpable. I will be making that one again! Since I can’t unveil it at a nonexistent party this year, I encourage friends to invite themselves over for a taste. It’s worth it. Well that is it for my fridges. I actually like my pantry better than my fridges, but there isn’t a day of the week starting in “p.” Hope you liked seeing inside my own personal refrigerated section. But about what will I post next Friday? Even I don’t know yet. Suggestions are welcome.